Artist’s illustration of Proxima b, the Earth-size world that orbits the red dwarf star Proxima Centauri. Proxima b may have a neighbor: Astronomers have just detected a candidate planet in the same system. BERKELEY, Calif. — The nearest exoplanet to Earth may have a neighbor. Astronomers have detected a candidate planet circling the star Proxima Centauri, a dim red dwarf that lies just 4.2 light-years from our solar system. Proxima is already known to host one world, a roughly Earth-size planet called Proxima b. So, the potential sibling world is Proxima c. But "potential" is the key word. "It is only a candidate," Mario Damasso, of the University of Turin in Italy, said during a presentation today (April 12) at the Breakthrough Discuss conference here at the University of California, Berkeley, which was also webcast live. "This is very important to underline." Damasso, fellow presenter Fabio Del Sordo of the University of Crete and their colleagues analyzed observations of Proxima Centauri made by the High Accuracy Radial velocity Planet Searcher instrument. HARPS, which is installed on a telescope at the European Southern Observatory's La Silla Observatory in Chile, notices the tiny stellar movements induced by the gravitational tugs of orbiting planets. The instrument's data helped lead to the discovery of Proxima b (and many other alien worlds as well). Proxima b circles in Proxima Centauri's habitable zone, that just-right range of distances where liquid water could exist on a world's surface. It's unclear whether Proxima b could actually host Earth-like life; for example, the exoplanet is likely tidally locked to its star and perhaps therefore sports a scorching dayside and a frigid nightside. And flares from Proxima Centauri may have stripped the alien world's atmosphere long ago, some scientists say. Debates about habitability likely won't attend the confirmation of Proxima c, should that happen. 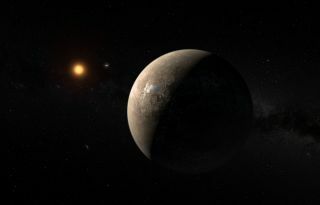 The candidate world, which has a minimum mass about six times that of Earth, orbits 1.5 astronomical units (AU) from Proxima Centauri and is therefore probably very cold. Its equilibrium temperature hovers around minus 390 degrees Fahrenheit (minus 234 degrees Celsius), Damasso and Del Sordo said during their talk today. That substantial orbital distance also made it challenging to spot Proxima c; the planet''s tug on the star is pretty weak, after all. Damasso and Del Sordo said they're confident in the detection but stressed that it is preliminary. For example, while the paper reporting the result has been submitted to a peer-reviewed publication, it hasn't been accepted yet. Confirmation of the planet could come from additional observations by HARPS or similar instruments, the researchers said, or from measurements by Europe's star-mapping Gaia spacecraft. Indeed, if Proxima c is real, Gaia should spot the planet by the time the spacecraft's work is done, Del Sordo said. And if the planet exists, many exciting opportunities open up. For instance, telescopes might soon be able to snap pictures of this exotic alien world. "Potentially, this is a spectacular laboratory for direct imaging," Del Sordo said.